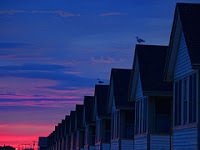 Generally, on the Outer Cape, we suggest that the potential buyer does a home inspection prior to the formal contract known as the Purchase & Sale Agreement. This usually happens immediately after we get agreement on the buyers' offer. 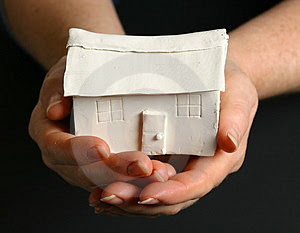 The buyer pays about $400 to get a qualified and licensed inspector to inspect the home. Another option is to have the home seller do a home inspection prior to putting the home on the market. By doing so, and fixing what needs fixing, the seller can assure prospective buyers that the home is in tip-top shape and thus demand a higher selling price. The buyer, of course, can still do an inspection. A recent HGTV FrontDoor website makes a strong argument for this method. Read the article ... Here. Every once in a while I come across an exceptional set of photographs. It's particularly exciting when they were take on the Outer Cape. A set by Ed Steinerts from Milford, CT, caught my eye and I've gotten permission to highlight it on my blog. Check out his slideshow...Here. Ed has quite a number of photo sets on Flickr.com. Check them out. 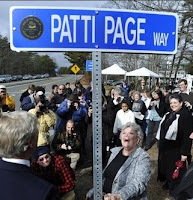 The Cape Cod Chamber of Commerce today honored Patti Page with a reception and the official unveiling of the street sign for the street named after her. Patti has the vocalist of the famous 1957 song Old Cape Cod. The Cape Cod Times website has a slide show of Patti and the unveiling. Patti Page is looking pretty good. One of My Clients Is An Author! A few years ago I had the pleasure to assist Kermit Moyer and his wife in the purchase of their new home in Eastham. They subsequently completely remodeled and updated the home on one of Eastham's small ponds. Kermit was a professor of literature at American University prior to moving to the Cape. Kermit has just published a somewhat autobiographical novel that the reviewers are raving about, called The Chester Chronicles. Get his book online at Amazon... Here. Kermit will have a book signing at the Booksmith/Musicsmith Store in Orleans this coming Saturday, February 27th, from 11 AM to 1 PM. Last month it was Eastham and Wellfleet - this month it's P-Town. Cape Cod author, Christopher Setterlund, has a series of articles that he calls "In My Footsteps", one of his recent visits was to Provincetown. 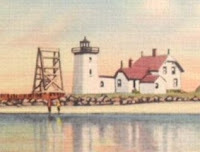 Christopher visited several of P-Town's tourist locations, including the Pilgrim's Tower, Commercial Street, the Old Harbor Life Saving Station, and the Long Point Lighthouse. Check out the article on the In My Footsteps blog. I've decided to join the Eastham Chamber of Commerce. It's about time! The Chamber offers services and directories for use by Eastham visitors, residents, as well as Chamber members. Check out the Chamber's website. Selling One To Buy Another? Are you considering an 'upgrade'? Will you sell an investment or rental home to purchase another? You need to consider the tax implications of such a sale. As a second, rental, or investment home your profits are likely taxable, unless you take advantage of an IRS rule known as a "like-kind" exchange. This is sometimes referred to as a IRS 1031 exchange. Think of a 1031 exchange as being similar to a IRA rollover, except with real estate instead of securities. There are lots of rules that need to be followed and you will need to hire an 'exchange agent', but the benefits of a 1031 exchange can be enormous. Check out 1031 exchanges on the Parker-Scheer website...Here. This issue has the Year-end 2009 results for Eastham's neighboring towns. 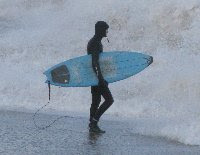 Also in this newsletter are articles about the Eastham Chamber of Commerce, the results for January 2010, and much more! It's getting closer to the dreaded April 15th income tax deadline. But, it's not too late to sort out how you may benefit from a few little known tax breaks for your 2009 tax return. Check out this timely article from SmartMoney.com. It's 68 ft tall and sits at an elevation of 50 ft. 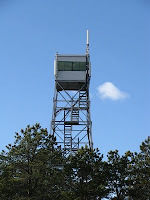 Check out the tower's webpage. I was out looking at new listings this morning and was at the Eastham side of Rock Harbor. 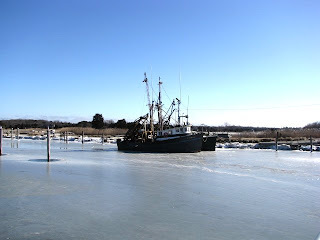 I found these two fishing boats, locked in the ice - waiting for spring. With snow coming tomorrow, spring may be a ways off. After the recent storms six complete pilot whale skeletons were uncovered on the beach off Lieutenant Island in Wellfleet. The Turtle Journal blog ran a long story, with photos and videos that is a good read. Take a look! As sands shift we are often treated to a history lesson. Last year, and in 2008, we saw the remnants of a schooner from the 1800s. Check out these photos from my website. 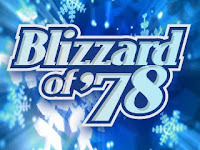 The massive snow storm known as the Blizzard of '78 was 32 years ago this week. This storm caused major erosion damage to the ocean shoreline, particularly the area near Coast Guard Beach. This article (and the accompanying video) tells of a group of young folks who got caught in the wave over-wash and were forced to abandon their VW beetle. Fortunately, the folks (and the car) all survived. Check out the article... Here. I came upon this really neat slideshow of photos of the Outer Cape, from Chatham to P-Town. These photos were taken by Meredith Baker, of Boston. See if you can figure out what some of these photos are... go here for the slideshow. The photos were taken last fall. Enjoy! The blizzard on 1978 hit the Outer Cape, and notably Eastham's Coast Guard Beach, as more of a tidal event than a snow event. The tides were exceptionally high, resulting in the complete destruction on several homes that were on the outer beach, including Henry Beston's (author of "The Outermost House") home. The video, below, is of Noel Beyle, an Eastham historian, who witnessed some of the power and destruction first hand. January has (almost) always been a fairly big month for sales in Eastham. Last year was an exception. It seems that late fall sales often result in January closings. It's too early to say that last year's sales draught is over, but we certainly started off well. The median sale price in January was $360K. I took this photo two days ago while researching a home in Brewster. 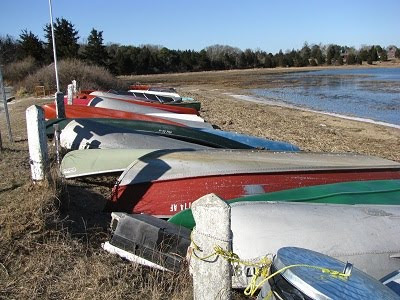 This photo was taken at Linnell Landing in Brewster. 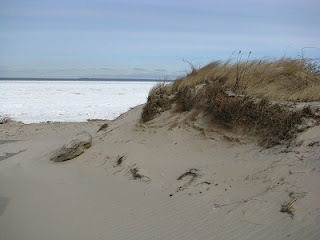 There was no snow on the ground but the white band off the beach is all ice. Hmmm. 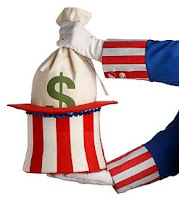 Homebuyers' Tax Credit - Time Running Out! The new 'expanded' home buyers' tax credit program will run soon, April 30th. This will provide up to $8000 for 'first time home buyers' and $6500 for 'move up buyers'. That means that you need to be under a formal contract (i.e. Purchase & Sales Agreement) by April 30th. These credits only apply toward the purchase of a primary residence. Read more about this credit on my Lowes/Rismedia home improvement page....Here. I stopped by Hemenway Landing today. Another crystal clear still day. Is It Hard To Decide To Sell Your Home? Of course it is! Particularly so if you are underwater on your loans or you project to take a loss, however modest. It's human nature to want to hold out for a profit, even if waiting will likely make the situation worse due to continuing costs or falling market prices. I came upon an article that addresses this dilemma and offers some practical advise to help you come to grips with your situation. The article, entitled "Are You The Reason Your Home Won't Sell? ", can be found ... Here.